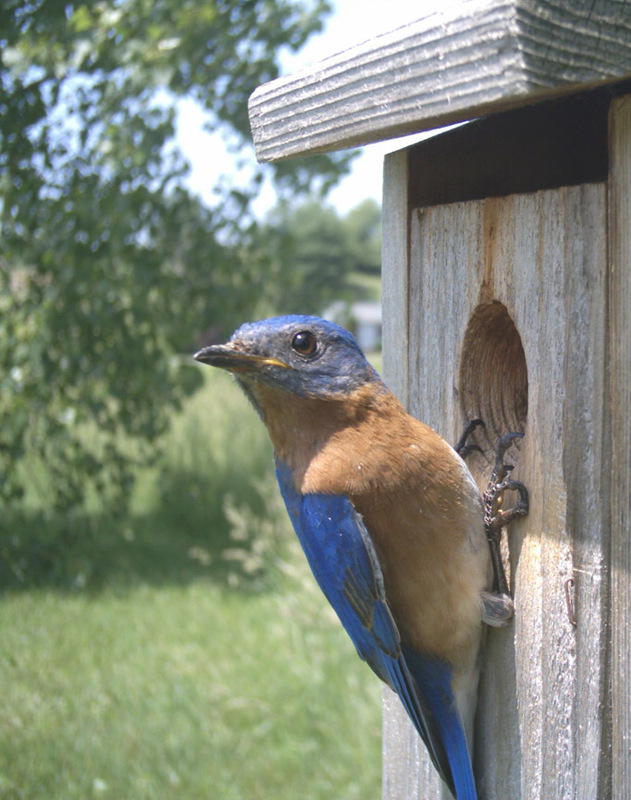 To monitor and increase production of Eastern Bluebirds through a statewide nest box program. The corporation is organized exclusively for charitable, educational, or scientific purposes within the meaning of Section 501(c)(3) of the United States Internal Revenue Code. The New York Bluebird Society was organized in 1982. More than 30 years of successful programs have helped restore the nesting population of the Eastern Bluebird and other cavity nesting species. The decline of bluebirds was recognized in the 1950s and 1960s. Lawrence Zeleny, and those he influenced, urged that nest boxes be erected to replace lost natural cavities. Bluebirds became a passion among the conservation-minded. Trails of nesting boxes were established throughout North America. In the 1970s, Fran Hanes, John Rogers and Paul Wilson, and others they involved, began building and installing nest boxes. In 1982, they attended the 5th annual convention of the North American Bluebird Society at Southern Pines, North Carolina. On their return trip they agreed to organize a bluebird society. The first newsletter was published to announce the first meeting, held April 17, 1983, at Lake Forest Sportsmans Club in Brewerton. Fran Hanes, first president, presided. Spring and fall meetings have been held each year since. Membership in the Society surged to more than a thousand. The financial future of the Society was secured by Fran Hanes’ generous bequest and the proceeds from hosting the 2004 NABS convention at Ithaca. Income from memberships, donations, sales and bequests provide annual program support. Atlas for New York State showed an increase of 70 percent compared with the Atlas of 1980-1985. Awareness of the need for nest boxes has increased through publicity and educational activities. Trade shows and field days have featured exhibits, videotapes and fact sheets that increase interest in restoring bluebirds. Educational meetings have encouraged use of nest boxes and regular monitoring to improve nesting success. Local activities have proven most effective in increasing use and management of nest boxes. Nest box records provide anecdotal evidence of nesting results. Volunteers play key roles in educational programs that continue to improve nesting success of bluebirds and other cavity nesting species. NYSBS County Coordinators and Bluebird Ambassadors, working with their Area Coordinator, recruit and support volunteers. The educational activities involve people in installing and monitoring nesting boxes in desirable habitat. Nesting boxes in poor habitat, or subject to predation, are moved to promising sites, or removed. These activities have proven to enhance nesting opportunities for cavity nesters. Annual summaries of nest records document nesting success. It is hoped you will become as excited as the throngs of bluebird enthusiasts who have helped the New York State Bluebird Society “bring back the bluebirds”.